Reliable software for punching, laser cutting, autonesting, and 3D CAD Link. Service and support are good enough! One nesting solution can contain a few SubNests, each with a different material and thickness. 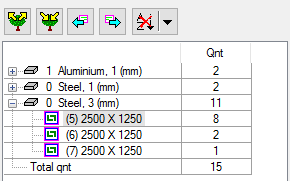 Parts from the same order but with different material/thickness are sorted automatically and nested on appropriate sheets when AutoNest runs.